It’s that whole Fall thing, that desire for rich and creamy and not-exactly-lite fare. Frankly, I am tired of salads. Around April, I get excited for them, with the snow peas and baby greens and all, but come September we all start a’hankerin’ stews and pot pies and anything with an obscene amount of buttery gravy and possibly alcohol. Now that it’s mid-to-latish October and we actually get to put a real blanket on the bed and not just another sheet pretending to be a blanket, I am making rich fattening filling meals. Because Winter is coming and we need that extra subdermal layer of adipose tissue to provide energy during the hibernation period. Except that we’re not bears or squirrels. O well. Perfectly roasted, do not let the skin go to waste, even though it doesn’t go in the recipe! 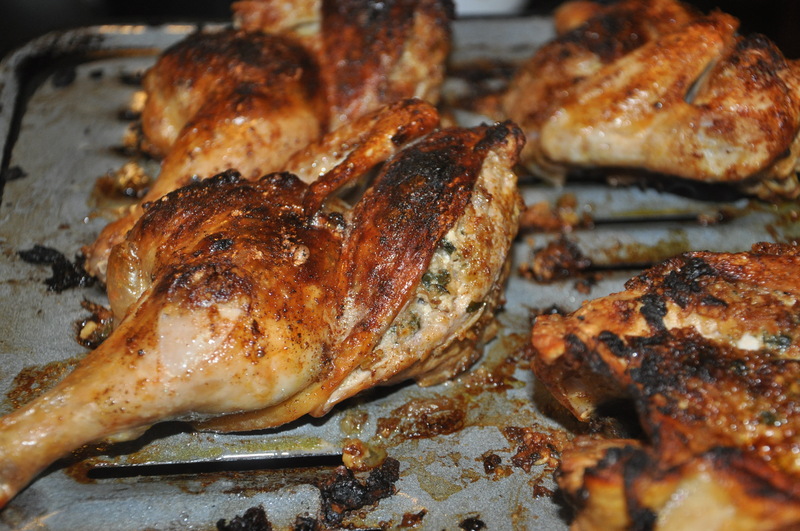 mmmmm crispy skin…. 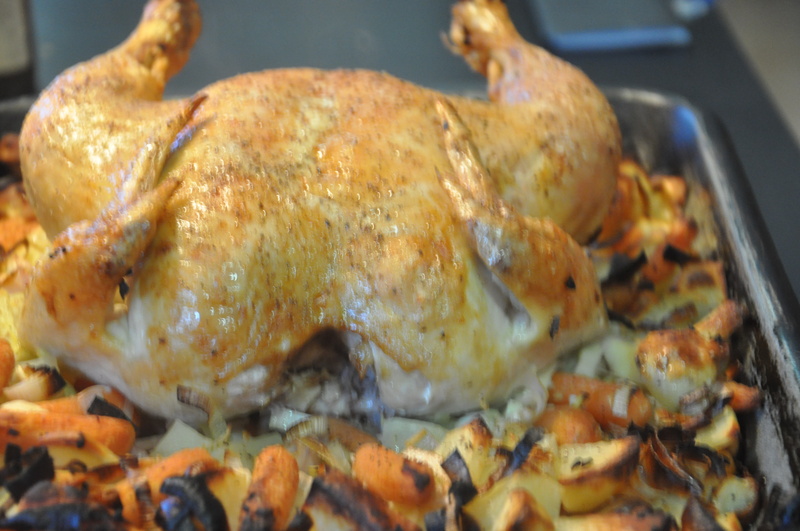 Ok so we don’t need that, but isn’t there something wonderful about knowing that your house has the aroma of roasting vegetables, garlic, and chicken, and you can catch a whiff even as you turn into the driveway and KNOW that you did something RIGHT and your family will approve? Yes, there is. In the bowl, waiting for the gravy. See, no skin. It would just get nasty and limp. Go ahead and eat it. This chicken pot pie recipe was first spotted in a Fine Cooking magazine eons ago…I don’t remember which issue, but in the interest of full disclosure, this is not my own unique recipe. However, I have made a few changes, particularly in the top crust. Pour in all that lovey silky gravy. 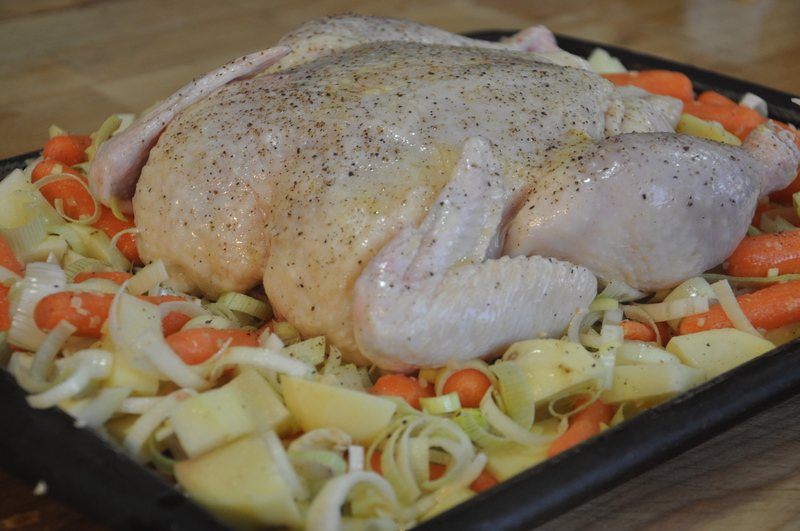 Don’t forget to add the crusty bits from the deglazed roasting pan! I am not a pastry chef. Whenever possible, I buy the pie crusts in the refrigerator section of the store. Sometimes I use those crescent rolls. The original recipe had you making this buttery puff pastry from scratch and the 3 times I tried it, it turned out this greasy unpleasant stuff. So, I switched to a biscuit top. Who doesn’t love that? I reckon you could use canned biscuits, but with so much effort going into the filling, I’d rather make semi-homemade. Yes, you could make biscuit dough from scratch and it would be lovely. I am tired. I have spent the entire day making the filling and doing endless loads of laundry so I used a biscuit mix. I wanted biscuits with herbs mixed in and that’s hard to do with canned ones. 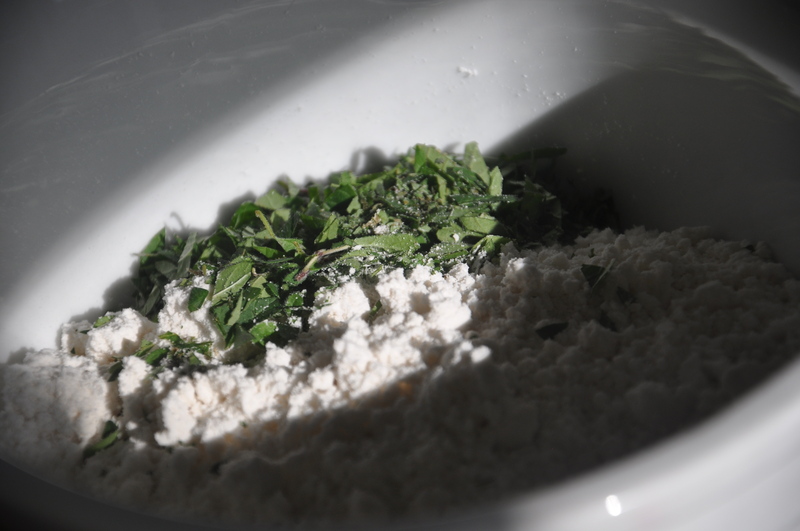 They are slightly customized with buttermilk (add a bit of baking soda to the mix) and lovely chopped oregano and thyme. As always, after picking all the meat off the chicken, I roasted bones with an onion and a couple of carrots, then threw it in the crockpot with a gallon of water to make stock. I am mildly embarrassed to admit that I used commercially made stock for the recipe, because I was all out of the homemade. It was a sad state of affairs, but one punts when one has to. 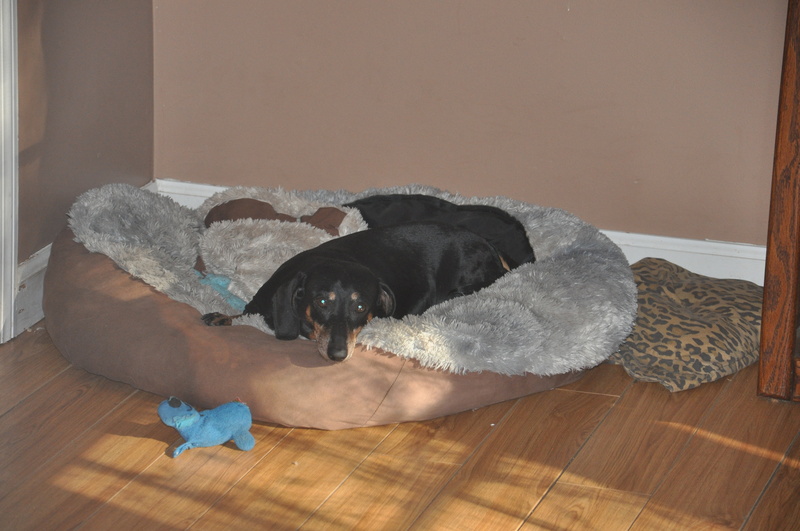 Daisy was feeling lazy and was pouting because I didn’t share the chicken skin with her. 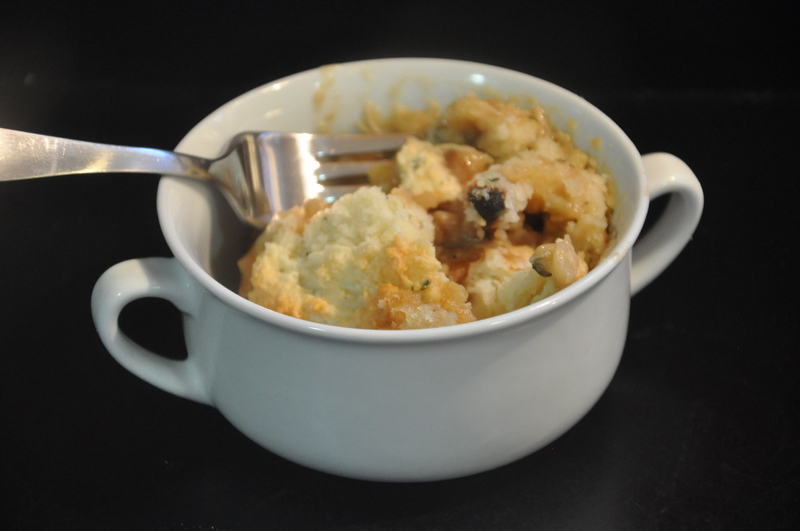 This recipe makes a very large amount, so divy it up into 2 casserole dishes, and then cook one of them until the biscuits aren’t quite brown, cover it with foil, and freeze it or give it to a sick friend, so they can warm it up when comfort food is required. mmmm with a glass of white wine and a blanket, and a good movie…perfect. Preheat the oven to 450 degrees. Put the cut up vegetables and garlic in a big bowl and drizzle them with olive oil, salt and pepper. Toss to coat. Put them all in the bottom of a really big roasting pan, and put the chicken on top. Drizzle a little oil,salt and pepper on the chicken. Put it in the oven and roast for an hour, until the chicken is crispy and brown, and the veggies are brown and it all smells so good your 24 yr old son wanders in and announces that he’s hungry. After an hour, take it out of the oven. The vegs underneath the chicken might not be completely done and that is OK. Also, the chicken might not be 100% done and that is OK too. Let it cool long enough that it is easy to handle (about the amount of time it takes to fold 2 baskets of laundry and watch an episode of CSI you DVR’d last week). 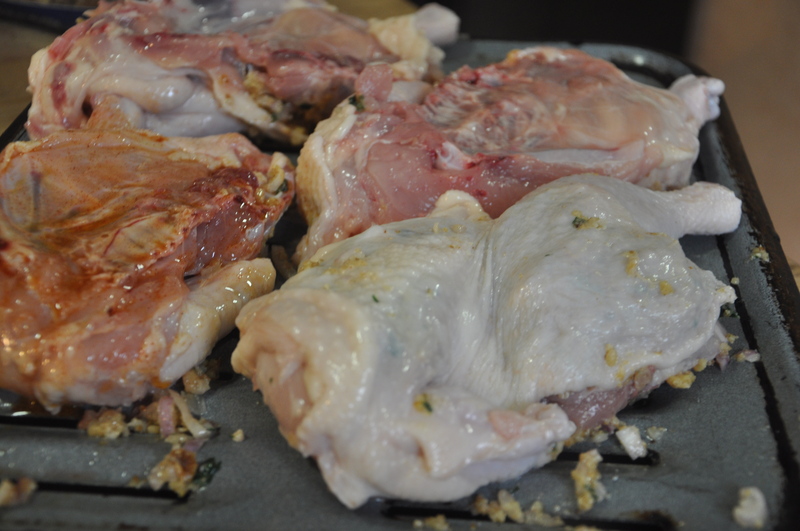 Pick all the meat off the chicken and tear it into small pieces. Put it in a huge bowl, and scrape the vegs over into it too. Add the chopped herbs. There will be crusty stuff in the roasting pan. If it’s a metal pan,set it on the stove and turn the stove on to medium. Add the white wine and deglaze the pan, scraping up all the crusty bits. Set that aside. In a pot, melt the butter and stir in the flour. Let this cook on low, stirring occasionally until it is a light toasty brown and smells like something you want to eat all by itself with a spoon.. Slowly pour in the carton of chicken broth, stirring with a whisk. Turn the heat up a little. Scrape the crusty wine stuff from the roasting pan into it. 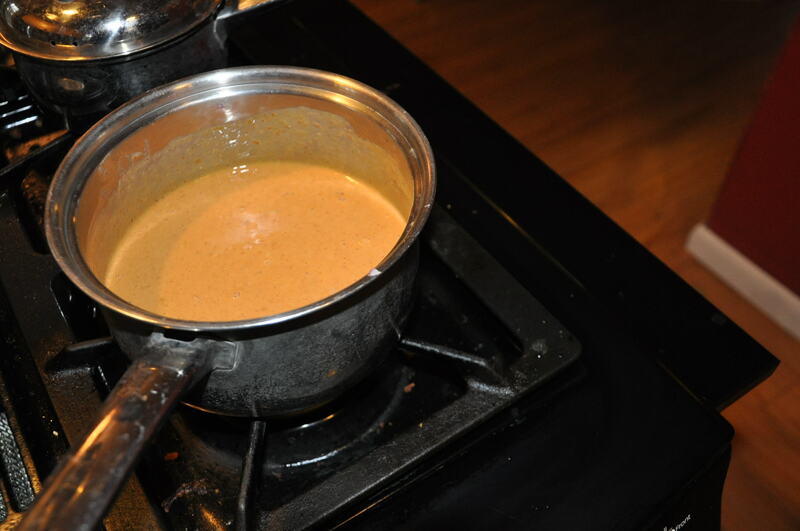 Stir frequently until you have a nice medium-thick gravy. 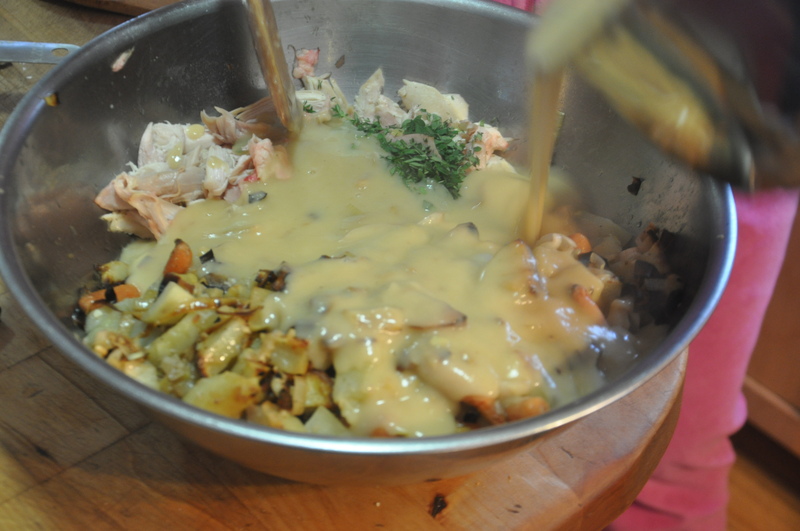 Pour the gravy over the chicken and vegs in the big bowl and stir it all up. 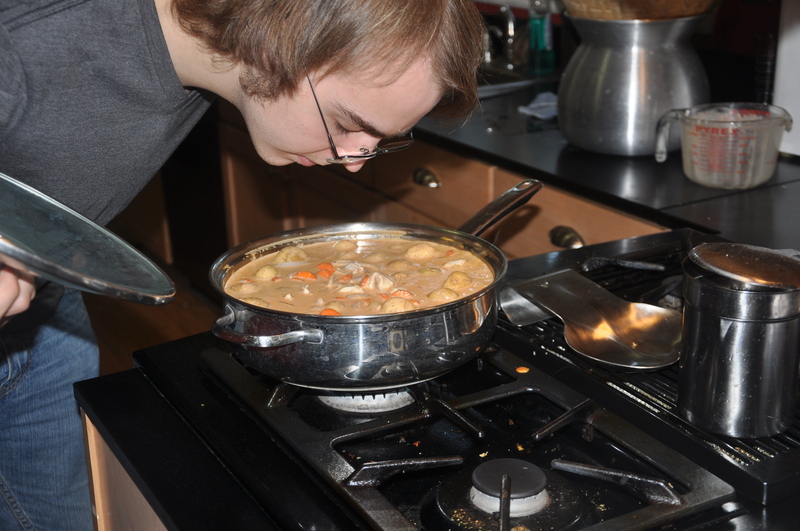 Spray a couple of casserole dishes with no stick stuff, and put the filling in each dish. I used a 9×9 and an 8×12 oval pan. Drop by generous spoonsful onto the filling. Bake at 375 degrees for 45 minutes,until the biscuits are brown and the filling is bubbling up. When I was making out the menus this weekend, I decided to consult James Beard for some chicken ideas, and the first one that caught my eye was his recipe for Piquant Broiled Chicken Halves. Then, today happened. It started with a squirrel running under my tire and dying tragically. I hate it when that happens. Poor squirrel. Later on I bought groceries and even though I had my usual compulsively organized (by aisle and type of container) list, I kept having to backtrack for that one stupid thing that was under something else on the list and then there was this…child…I guess it was a child, but it sounded like some kind of electronic sonic weapon used by the government to incapacitate enemies…and I don’t think the child took a breath for 15 minutes. That was a little icing on the squirrel doughnut. Then there were Highly Charged Issues with a certain son (no longer a child) of mine, involving parking at the Race coming up this weekend (NASCAR, baby!) and the apparent (to him) inability of people who handle these things to know what to do with all the cars that will be showing up there and how we need to get there the day before and stake out a place. O HAIL NO. That was sprinkles on top of the icing of the squirrel doughnut. So, I decided what was needed was some serious pouting. I pouted. With vigor and the honed skill of a 47 year old Southern Housewife. After shedding a few tears of deep self pity, it was time to focus on something productive, and today’s menu featured this lovely chicken recipe. James Beard’s recipes tend to be rich…and that was just what was called for since I wasn’t willing to drive the 3 miles to Daylight Donuts and get a chocolate frosted with sprinkles. Also- I’d never split a chicken before. I can carve one like nobody’s business, but the whole split-it-in-half-take-out-the-backbone thing sounded…complicated. Until I remembered those Marvelous Kitchen Shears (heretofor used only for cutting roses) that my brother gave me for Christmas a few years ago, and sort of recalled having seen something on TV of someone cutting a chicken in half and that was all there was…easy as pie. First,, you cut up either side of the backbone and remove it, just chomp on through the ribs. Then, you fold the spineless bird open and cut through the breast bone. And there it is. No pictures because I had my hands full of raw chicken. You know, I hate having chicken goop on my hands. I dislike any sort of goop, really. Slimy sticky wet stuff on my hands is gross and when I am working with chicken parts I have to wash the hands several times or become unable to function due to the grossness. I suppose I could wear gloves but that’s just as bad. 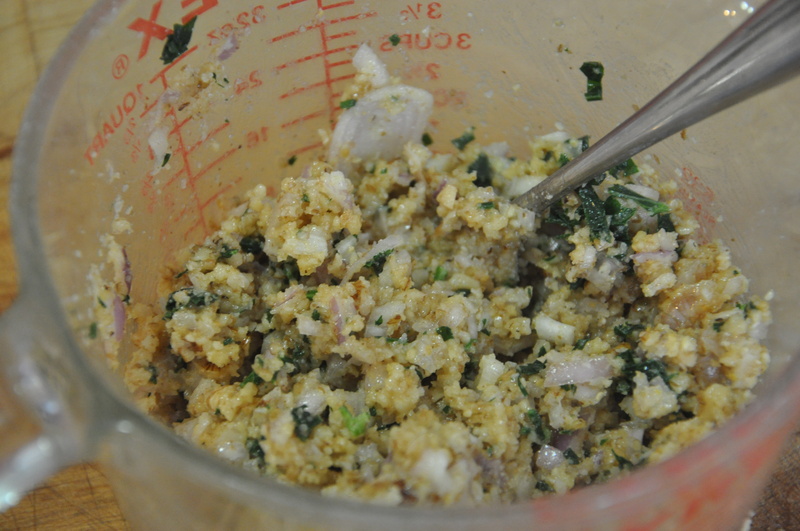 Combine the nuts, shallots, 4 tablespoons olive oil, salt, parsley, mustard, and several squirts of Tabasco to make a paste. Loosen the skin on the chicken by siding your fingers between the skin and the meat (then compulsively wash them after each half), and stuff the paste under the skin (again compulsively washing your hands, and make note of the can of Badger Balm on the shelf for later when you realize how chapped your hands are). 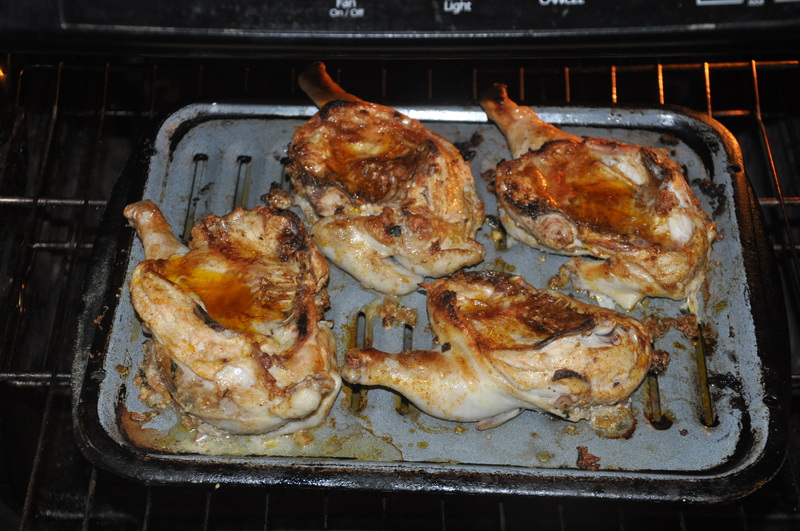 Put the chicken on a roasting pan, bony side up. Turn them over, brush with the basting mixture, and broil for another 12-14 minutes. Daisy guards the oven. Good dog. mmmm that’s skin what needs to be picked. The skin gets delightfully crusty, the shallots sweeten up, and the nuts are an amazing rich flavor and texture that go so well with the tender small birds. 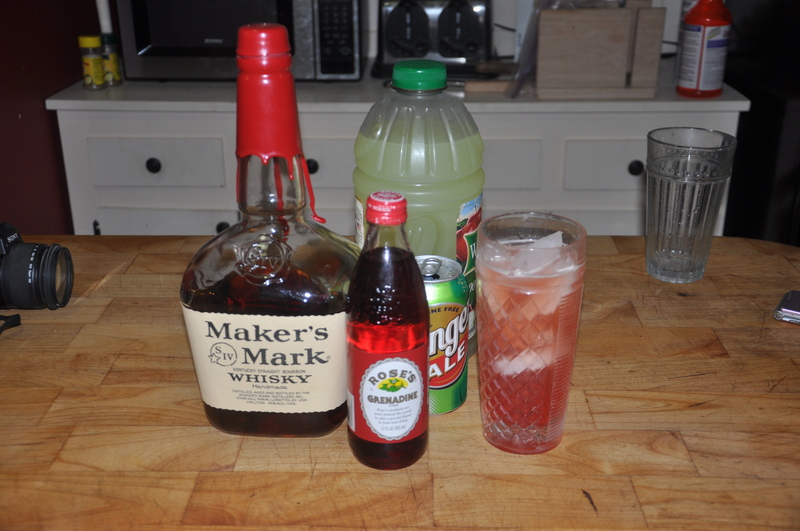 I used the amounts of Tabasco he recommended, and I think it could stand a bit more. Next time I might use half again as much. If you are not fond of spicy-heat, cut back on it a bit, but definitely use it, because the flavor is good in there. It improved the quality of the day, especially served with a heap of buttery homemade mashed potatoes. I absolutely LOVE Massaman Curry. 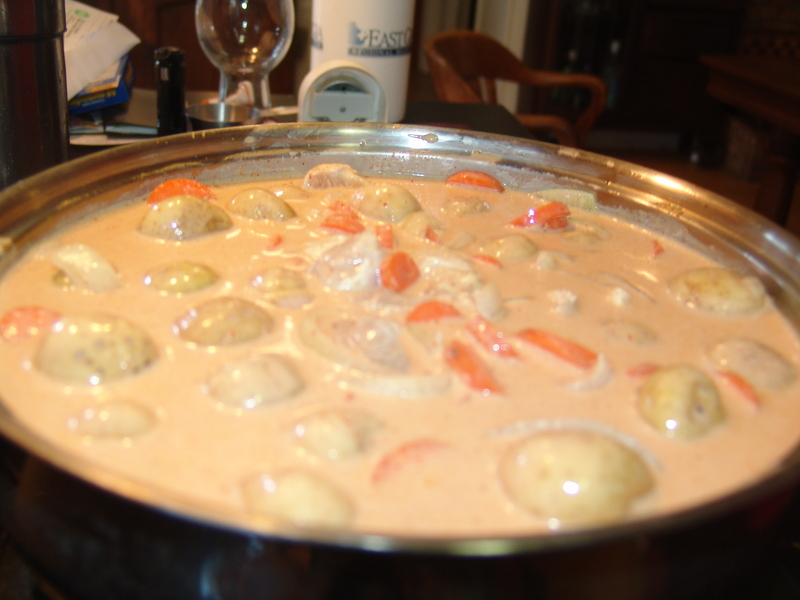 It is the mildest of the Thai curries, and creamy, and comforting with it’s potatoes and carrot and chunks of chicken. The first Thai curry I ever had was Massaman. The second was Green curry and I ate 2 bites before deciding it was far, far to BLASTINGLY BLAZING HOT HOLY COW PEOPLE ACTUALLY EAT THIS ON PURPOSE! Well, I know they do. 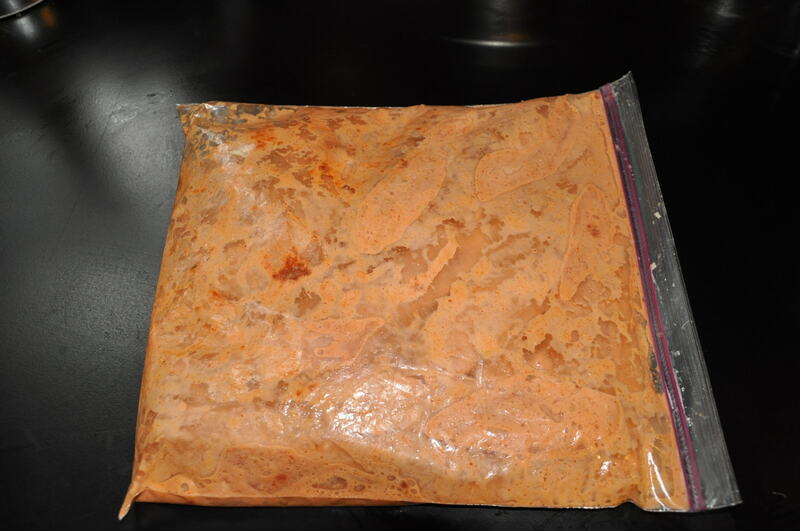 I knew a woman from Sri Lanka who went through an entire GALLON of Sriracha hot sauce in 2 months. A long time ago I discovered Maesri curry paste. They come in all sorts of flavors. You can find them in Asian grocery stores and online here. You can also get tasty recipes at both places. The first time I made a curry, I did it the hard way, with all the ingredients, all the fish sauce and lemon grass and stuff and boy was it good but it took forever because it was the first time I’d ever made it so I had to read the recipe every 30 seconds and make sure I didn’t leave something out. Sometimes I don’t feel like doing that. Sometimes I want curry and I want it NOW,without having to plan a trip to Savannah for lemongrass because the freezer died and the lemongrass that was in it spoiled. Thus, there are cans of curry paste in the pantry. And tonight, I wanted curry. Rich, creamy curry with lots of onions and tiny potatoes from the vegetable stand and carrots from someone’s garden. And sticky rice. Always sticky rice to soak up all that wonderful sauce. Not the nice California brown sticky rice, either. No, the white stuff imported from Thailand that causes the person working the cash register at the Asian market to question if I am capable of fixing it properly. And so it is…Massaman Curry with Sticky Rice, prepared in less than 10 minutes, and cooked for about an hour, while we sipped a bourbony drink and had convivial conversation. I think it’s why God invented Summer. 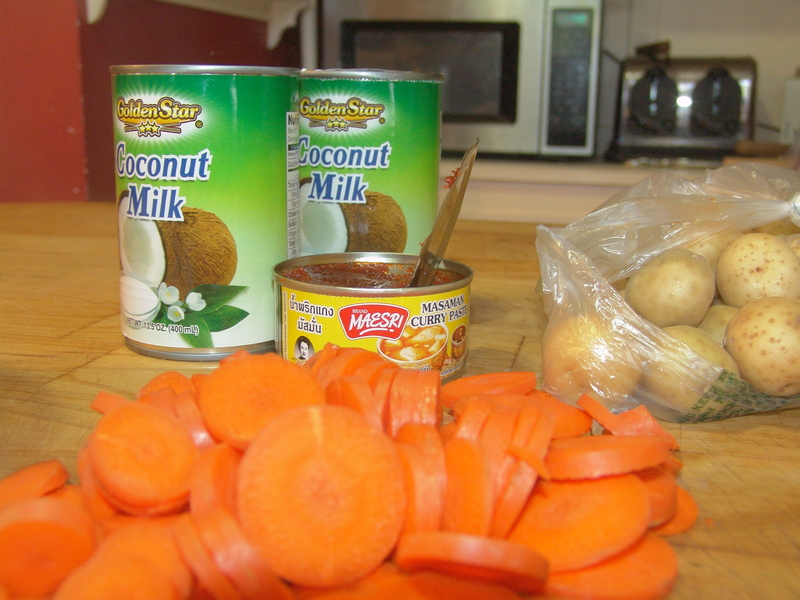 Sliced carrots, tiny potatoes, 2 cans of coconut milk, and a can of curry paste. 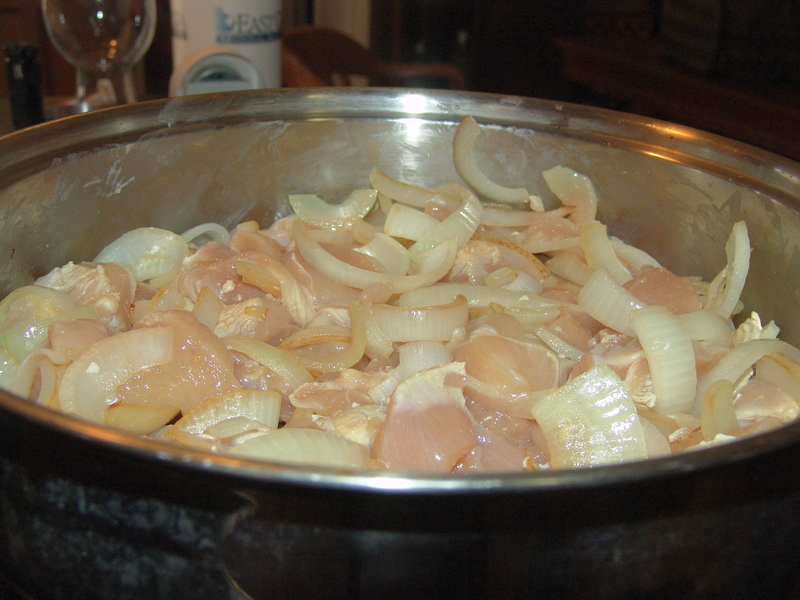 Saute onions in a little oil until soft, then add the cut up chicken breast. Mix the paste with the coconut milk. It requires careful supervision from the supervisor. 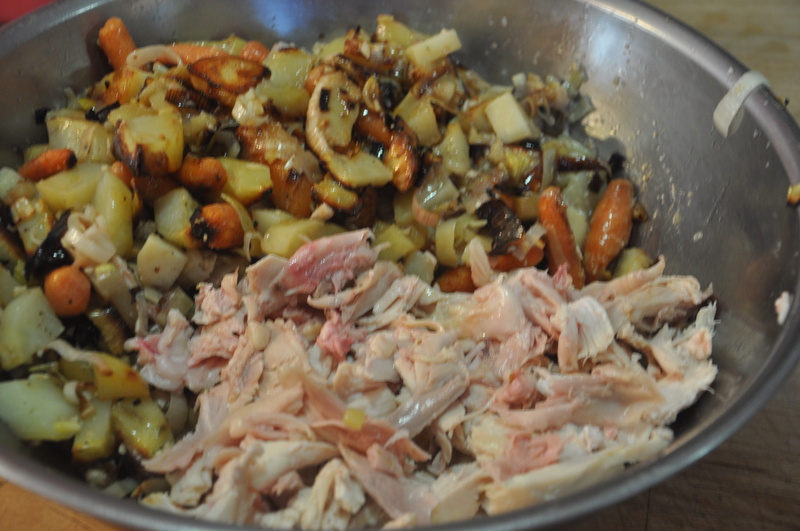 Add the sauce and vegetables to the chicken and onions. Ignore the comments about the potato booblets. Take an artful picture of you eldest child catching a whiff. 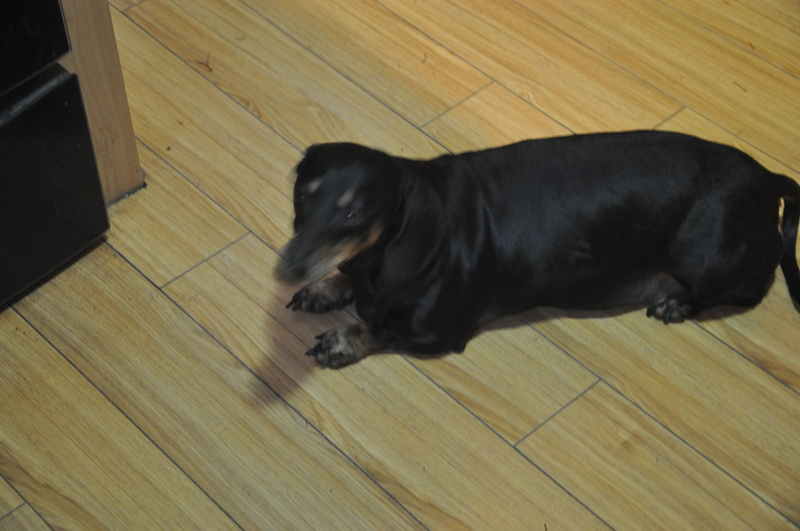 Then take another one after you figure out how to focus the camera. 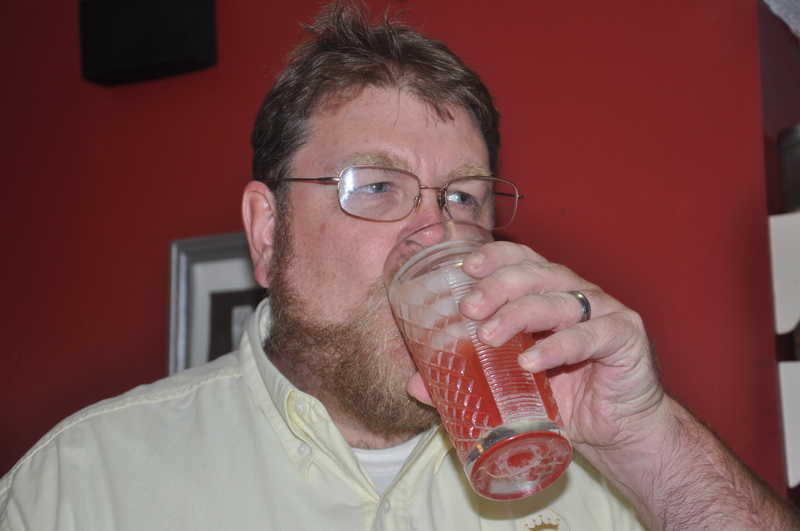 While the curry simmers and rice steams, fix a couple of glasses of Adult Beverage: 3 parts gingerale, 2 parts lemonade, 1 part bourbon, and a splash of grenadine. And it’s done. 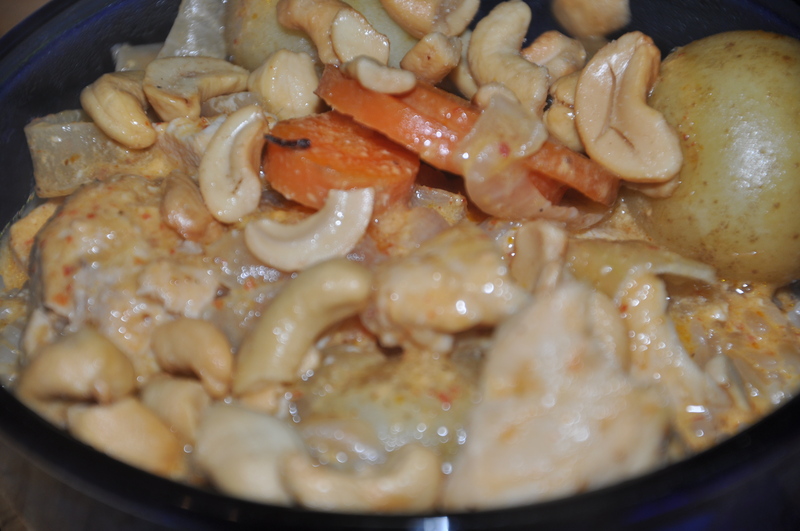 Serve on top of rice (sticky, if possible), and throw some roasted cashews on top. Put the oil in the bottom of a large deep skillet, heat up while cutting up the onion, then saute it until soft. Add the chicken and let cook while doing the other stuff. Mix the coconut milk and water with the curry paste. Pour over the onions and chicken. Put the carrots and potatoes in with the other stuff. Put a lid on it, turn down to a low simmer, and mix a drink. Let simmer about 30 minutes, then take the lid off and let it simmer uncovered for another 15-30 minutes, until the potatoes are soft and the sauce has cooked down a bit. It’s Sunday Potluck Lunch time, and today I’m taking crockpot chicken and rice. It doesn’t get much easier than this! 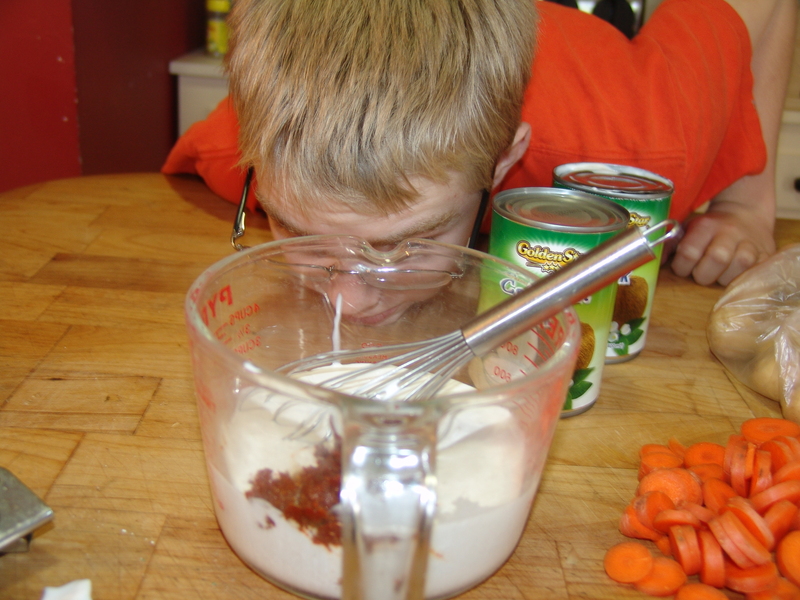 Mix together the cream of mushroom soup and the evaporated milk in a bowl. broth, rice, soup&milk, chicken breasts, seasonings. Put the lid on it and set it on low. The next morning, shred up the chicken with a couple of forks, right there on top of everything else. Then serve. The evaporated milk is optional, I like the creaminess it gives to it all. I love Thai food. That delicious combination of heat and herbs and creamy coconut,balanced with sticky rice and cool, crisp vegetables…YUM. Statesboro, Georgia is not exactly a culinary mecca. If you want Thai you have to make it yourself,from ingredients horded and carefully rationed until the next trip to Atlanta, where one can restock on lemongrass and bird chilis. In the mean time, I like those premade curry pastes. You can throw together pretty quickly a Thai-approximating meal that heathens like mine will never know that it’s a Southern White Lady’s attempt at being exotic. All you need are a few ingredients that happen to keep FOREVER in the fridge. 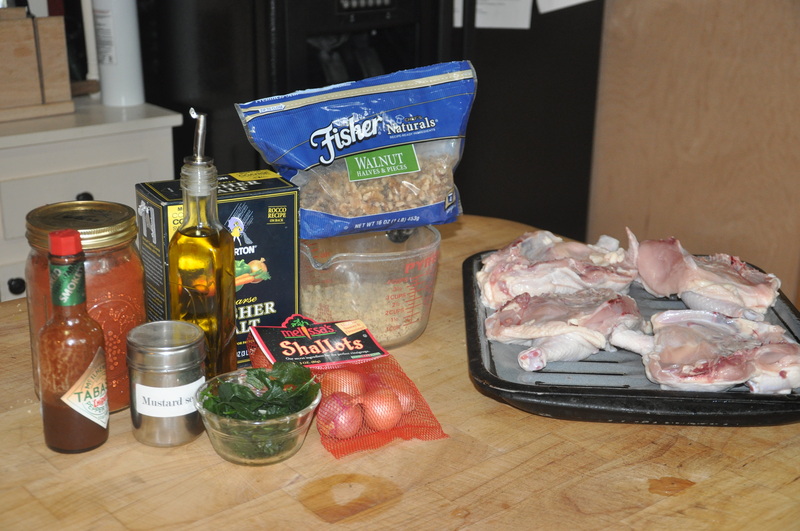 With these ingredients you can make a delicious marinade for chicken, and a peanut sauce to dip the cooked chicken into. 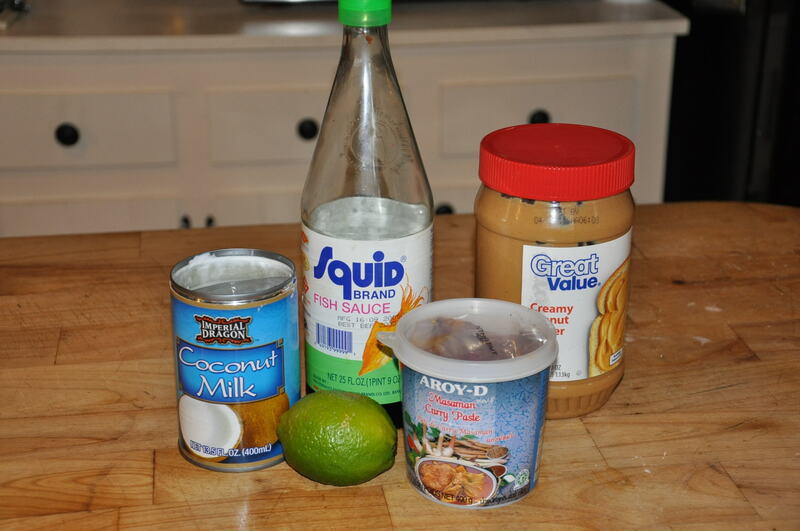 3/4 can of coconut milk (the rest will go into the peanut sauce)NOT Coco Lopez coconut stuff…unsweetened coconut milk!! 4 boneless skinless chicken breasts, cut into strips. Let this sit for a couple of hours, then thread the chicken onto skewers and grill or broil. The chicken is marinating in the bag. Warm slowly over low heat until it is bubbly. Serve on the side with the grilled chicken skewers. 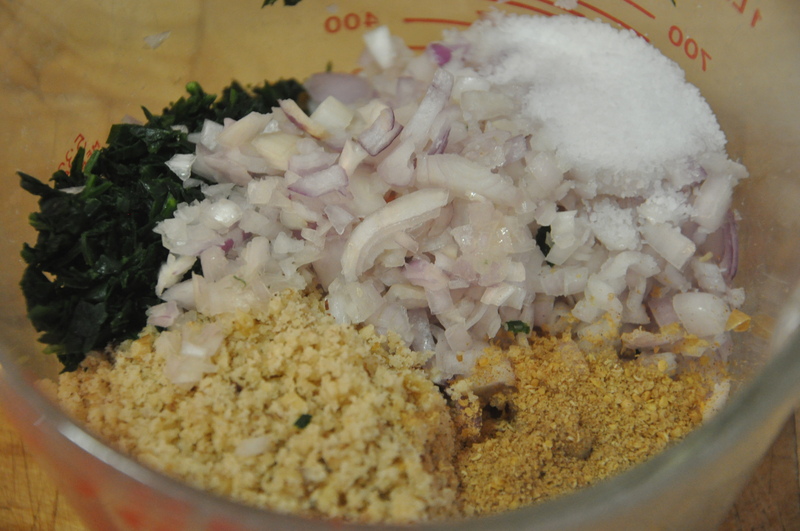 You can also add the leftover marinade from the chicken, since you’re cooking it anyway. 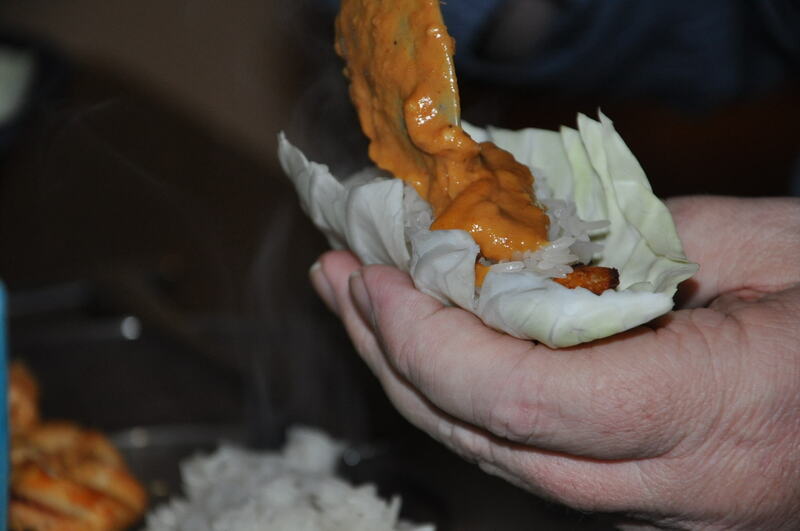 I like to serve this with sticky rice or regular white rice, sliced raw cabbage (my husband likes to take a cabbage leave and wrap it around some rice and a piece of chicken like a little package) and peanut sauce. Now, in this household, one member is allergic to coconut. So, in order to accomodate his needs and love of all food Thai, I simply replace the coconut milk in all these recipes with homemade chicken broth. Granted, it’s not quite the same, but it works for him. I make his own little bag of marinade and his own little pot of peanut sauce. First, make sure you have the right kind of rice. 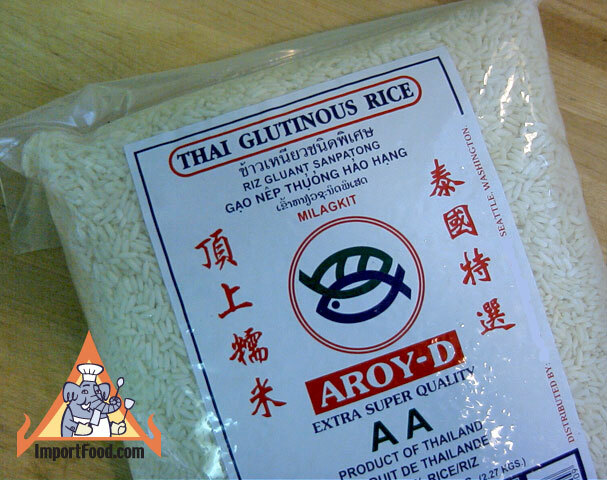 It’s also called sweet rice or sticky rice or glutinous rice. 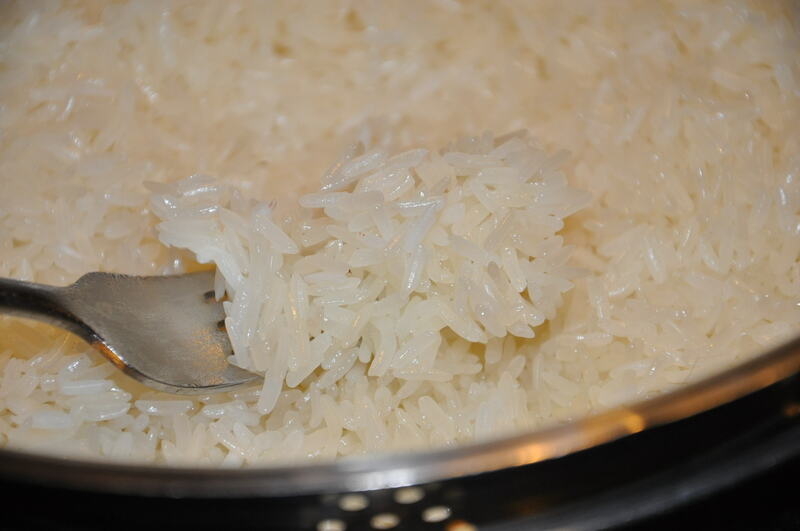 Measure out about 1 cup of rice per person and wash it really good- keep rinsing it until the water runs clear. Then put it in a pot and cover it with water by about 2 inches above the rice. Drain the rice and put it in a steamer basket. They suggest lining the basket with cheesecloth, but I have never done this because I never have cheesecloth. Put a few inches of water in a large pot and set the steamer basket on top. Cover with a lid and turn on the stove to medium high. There are many different Thai curry pastes you can buy. Massaman is the mildest and Green curry is the hottest…like NUCLEAR hot. BOOM SWEATY HOT. They are all delicious, and a bit different from each other, and I have made the recipe above using all of them. If you get the big tub of paste, theyhave recipes on the label that are tasty as well. This bit I’ve come up with is my own Southern White Version that my friend Hae Jun approved of, saying it was “not bad for someone who has never had real Thai” then she took me to a restaurant in Atlanta where I got to experience the real thing. A while later I took Terry (my beloved husband) there, pretty sure he’d love the stuff. He, of course,had to be The Man and order it Hot. The waiter (who was also the cook at that time) looked sceptical and asked if he was sure. Terry did some metaphorical chest thumping and said “absolutely!” When the food was brought out, it was all Terry could do to eat it without a complete meltdown. Afterward he told the cook/waiter that “hot really means hot, doesn’t it.” and the waiter/cook replied “Actually, I brought you the medium. white folks can’t handle the real thing.” Terry thanked him for his kindness and left a big tip.